I may have mentioned this before, but I’m not really a comic book reader. I have nothing against them (although I think I did in my silly youth), I just don’t really read them. 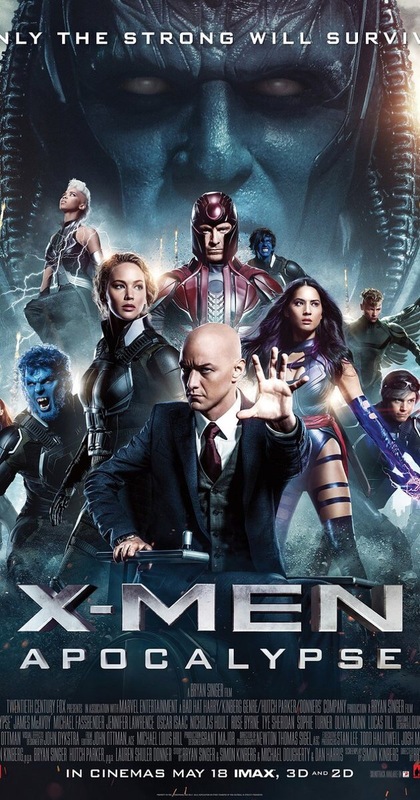 But, I have been a fan of X-Men since the 90s cartoon was on air and I can’t tell you how awesome it is to see the various story lines play out on the big screen. And while some X-Men movies were better than others, I am happy to see the franchise still going. The Plot Summary: There’s a new threat in town. Someone who calls himself Apocalypse. And this Apocalypse is said to be the first mutant. And it is said that he “gifts” extra powers to four people who calls themselves The Four Horsemen. And all this is coming from someone we met before; someone whose memory was conveniently erased. And Xavier visits this someone; this someone who gives him this information. And Eric is chosen as one of the Horsemen. I like this story line. I appreciate this story line. I like what they did with it. And this is coming from someone who doesn’t really know Apocalypse so if you didn’t like the story line and found it lacking because you know the origin of this story line, sorry it wasn’t up to snuff. It was for me. Let’s talk cast of characters. There are so many actors and actress in this franchise to go into a critic of each one would lead to a ridiculously long post. Even if I decide to focus on the core characters this post could get long-winded. There wasn’t anyone I found sorely lacking so if I were to look at the overall acting, it was well done. Everyone. James McAvoy (Xavier) and Michael Fassbender (Magneto) are still doing their thing, still on par with their bromance of sorts. Jennifer Lawrence (Raven/Mystic) is always awesome. I love that we see Kurt Wagner/Nightcrawler (he’s my second favorite with Remy Lebeau as the favorite) and Cody Smit-McPhee was awesome. I love the return of Quicksilver (Even Peters) and I hope he’s around for the rest of the franchise. We see young Jean Grey (Sophie Turner) and Jubilee (Lana Candor) and the Summers brothers (Ty Sheridan/Cyclops and Lucas Till/Havok<–And I love that we see Havok, if I had to choose which of these brothers were my favorite, it would be Havok). As I said, there was a slew of characters. Those were just the few I’m bouncing around in my brain. And the presentation. Graphics were awesome. Nothing too fancy or over-the-top, well, as much as you can get with the world ending. You know? I love the Magneto bubble and how everyone’s powers were displayed. I love how they portrayed the battle of the minds and the actual physical battle. It was pretty awesome. The camera work didn’t distract and moved the story along nicely. I love the flow of it. It was a Marvel Movie. Through and through. And then story. As I mentioned earlier, I liked this story. I don’t know Apocalypse’s origin story or how he interacted with the beloved X-Men. I vaguely remember an episode or two with Apocalypse, nothing concrete, just whispers. But I liked the idea of The Four Horsemen and the first mutant story. I liked how the X-Men were drawn in. First with Eric and then with Charles. I mean, I know these two are opposites but I love the push and pull of their relationship. The dynamic between these two have been nicely played out and I am loving it. The introduction of the next-gen X-Men was also nice to see. In some ways, it feels as if the story line took on too much, too fast, but it didn’t feel that way. It just felt natural so much props to the screenwriters for keeping an even flow of things. I can’t wait to see what they think of next. The story line could end here, but it could also continue (especially with Weapon X!). The Verdict: A must watch if you’re an adventure fan, a comic fan, a movie fan. Seriously. It’s good for most ages (of course, the little ones should stay home due to the jumps and scares that come natural in an action-adventure). It is a must add for any movie buff looking to build their collection as well. Naturally, Nightcrawler’s intro would top the list since I’m bias, but there is one scene that scoots by in a photo finish and that would be Quicksilver’s save. It’s a happy/sad moment (and you’ll see why when you watch it) but the action sequence, the graphics, and the touch of humor added to that scene was . . . beautiful.